Former EastEnders star Natalie Cassidy is apparently being lined-up to appear on Strictly Come Dancing. A source told The Sun: "Natalie’s thrilled. She is a huge fan of the show and it’s exactly what she needs to kick-start her career. Since leaving EastEnders she’s not done a huge amount of acting and this could really boost her profile. Natalie really wants to get fit too." 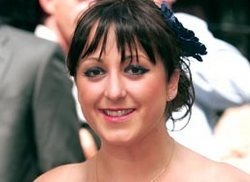 In 2007 Natalie Cassidy released a workout DVD after losing 4st with the help of a personal trainer. However, she later shot back up from a size 8 to 14 and admitted that she regretted the project. The source added: "Natalie knows she can lose weight, she just needs the motivation. She could have a new DVD out by Christmas. "She’s a big star and people really warm to her. Appearing on Strictly is a dream come true for her." So, if Natalie signs on the dotted line, she’ll follow in the footsteps of former Albert Square residents Phil Daniels, Jill Halfpenny and Jessie Wallace. In fact, if the BBC aren’t careful, the series could end up turning into a battle of the Walford heavyweights (and I don’t mean that literally), cos fellow EastEnders actress Kara Tointon (Dawn Swann) is also rumoured to be after a slot on the show after dancing her way to victory during 2008’s charity special. Anyway, I’m certainly looking forward to seeing Natalie Cassidy appear on ‘Strictly’ and wish her every success…but if I were her, I’d steer well clear of any workout DVD’s. Other stars who look set to appear on the show are former X Factor judge Sharon Osbourne and Coronation Street star Reece Dinsdale. So, it looks like we’re in for some great entertainment this Autumn. It\’s a bit sad really, isn\’t it. Fading soap stars like Todd Carty get demoted to The Bill, then it\’s Strictly Come Mincing, until finally you are reduced to opening supermarkets or even charity shops (that final indignity befell Graham Cole a.ka. as PC Tony Stamp in my own area a few weeks ago). Ms Cassidy will have three or four weeks in the spotlike then…kaput… whatever happened to Todd Carty?